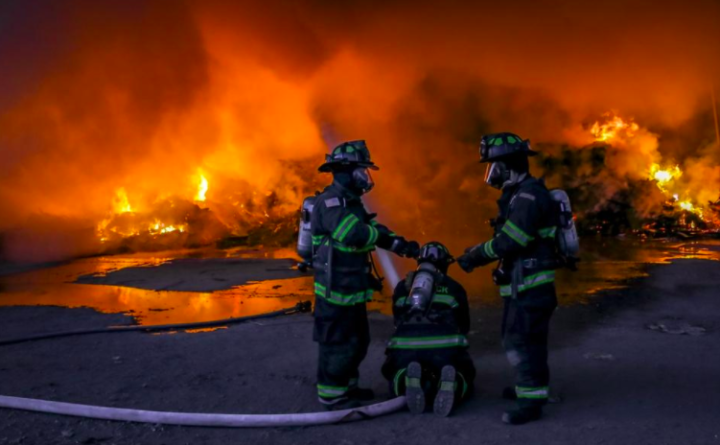 Firefighters fight an August 2017 blaze at Aggregate Recycling Corporation in Eliot. ELIOT, Maine — The Select Board settled a dispute between the Department of Public Works and fire department Thursday night by ratifying the contract with Teamsters Union Local 340, the DPW employees. At the board’s Oct. 11 meeting, Fire Chief Jay Muzeroll expressed concern about a provision in the draft contract that said DPW employees who are also call firefighters would not be allowed to respond to emergency calls during their working hours. The provision said the DPW director would review the work schedule each week to identify the “level of urgency” of the week’s work so call firefighters on the DPW staff could inform the fire chief of their availability for calls. DPW Director Joel Moulton submitted a letter to the board at the Oct. 25 meeting, which was not read aloud. Moulton said the intent of the union contract language is to “ensure the safety of all members of my department when others have to leave to respond to such a (fire) call.” For example, he said a work zone requiring traffic control requires four employees to work safely. Robert McPherson, a 35-year member of the Fire Department, said there were five calls in the previous six months during DPW work hours at an average of about 30 minutes each. He asked that the contract be tabled until the board found an alternate plan. The board agreed to table the contract. McPherson has since been elected to an open spot on the Select Board and was seated Thursday. Town Manager Dana K. Lee said the wording was from the old contract. After a brief executive session, the board ratified the new contract, which runs from July 1, 2018, to June 30, 2021.